Looking for vinyl flooring? Look no further, ProSource® of Newport News offers affordable, resilient, and waterproof vinyl flooring perfect for any home remodeling project. An option with several benefits, vinyl heartily stands up to traffic, pets, and spills, and is less costly than natural stone, wood, and ceramic flooring. 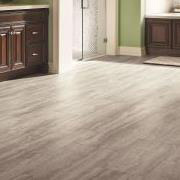 Vinyl flooring is easy to clean, and requires no grouting or refinishing. Vinyl flooring of the past came in standard sheet options with no real design draw. With today’s innovations in technology, it’s easy to find the perfect combination of texture, pattern, and durability for any space. 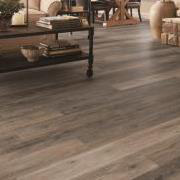 Luxury vinyl plank flooring, or LVP, is a carefree way to get the look of real wood. A popular flooring choice, it replicates nature’s species, colors, and surface textures while still providing the resilience and low-maintenance benefits that only vinyl can give. Most importantly, LVP holds up to moisture in a way real wood cannot. Luxury vinyl tile, or LVT, has also exploded in popularity. This flooring is designed to look like real stone or ceramic tile while delivering the durability and easy maintenance of vinyl. LVT’s resistance to moisture and everyday wear-and-tear makes it ideal for kitchens, bathrooms, and even basements. Luxury vinyl tile flooring is a smart and stylish alternative to more expensive tile options. 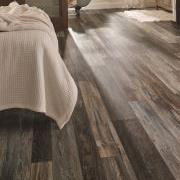 Sheet vinyl is often used as an alternative to hardwood, ceramic tile, or natural stone in spaces more susceptible to moisture, such as a bathroom, kitchen, laundry room, or basement. It’s tough, long-lasting, has a waterproof surface, and can be installed with or without glue. Today’s technology allows for beautifully crafted and ultra-realistic looking textures and styles, making sheet vinyl a perfect alternative to other flooring options. Engineered with materials like limestone, quartz, and glass, this flooring is warmer, softer, and easier to clean than natural stone. It can be installed with or without grout, and looks great on walls, countertops, and backsplashes, adding a level of versatility that other flooring options lack. Engineered stone is manmade meaning it is highly customizable — its measurements, veining, and colors are more precise than that of tile hewn from natural marble or granite. Wood plastic composite is a rigid core vinyl flooring that provides the look of real wood or stone. The W of WPC represents the wood/plastic backing that boosts the performance of functional, reliable vinyl. Wood plastic composite flooring is waterproof, easy to clean, and can be installed without glue or underlayment. Despite its technologically advanced construction, this engineered product is highly affordable. Like WPC, stone plastic composite is a rigid core luxury vinyl flooring. 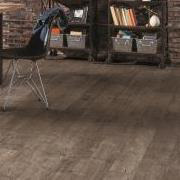 This tough vinyl flooring looks just like real stone tiles or real wood planks. It’s rigid enough to be installed over just about any surface, including uneven subfloors. The difference between WPC and SPC is in the backing: SPC is made from a stone/plastic composite that is sturdier than WPC’s wood/plastic backing, making stone plastic composite flooring a little less cushiony, but ideal for commercial spaces. VCT is strong because it marries vinyl and limestone. 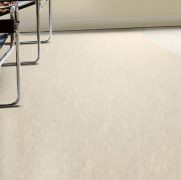 Best-suited for commercial spaces, such as schools and hospitals, these square tiles are affixed to the subfloor with glue. Installation can be tricky — no grout means the tiles must be perfectly aligned — so it’s definitely a job for the trade professionals. 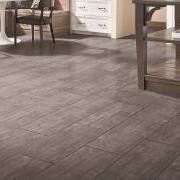 Vinyl composition tile is highly resilient and can be refinished repeatedly. For aesthetic purposes, VCT can be made to look like wood, stone, and even concrete.